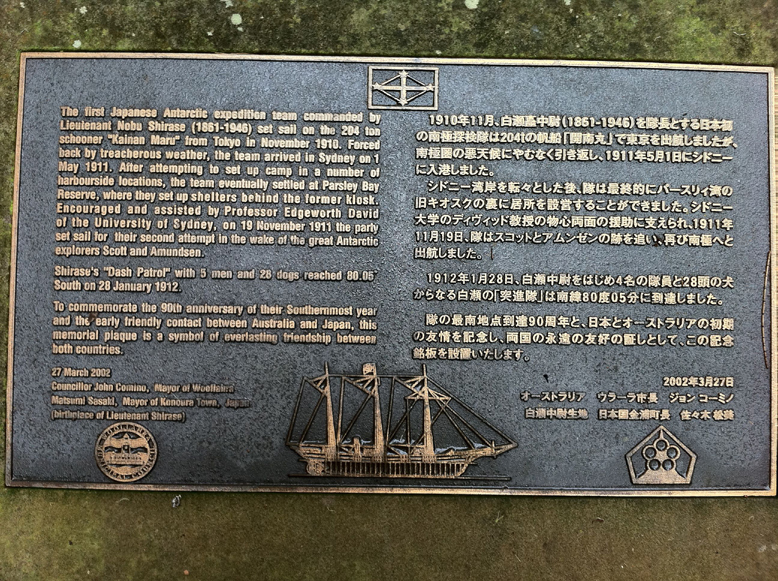 In the Parsley Bay Reserve is a memorial plaque (see photo above) erected in memory of the historic visit to Sydney, Australia of the Japanese Antarctic Expedition in 1911. The first Japanese Antarctic expedition team commanded by Lieutenant Nobu Shirase (1861-1946) set sail on the 204 ton schooner "Kainan Maru" from Tokyo in November 1910. Forced back by treacherous weather, the team arrived in Sydney on 1 May 1911. After attempting to set up camp in a number of harbourside locations, the team eventually settled at Parsley Bay Reserve, where they set up shelters behind the former kiosk. Encouraged and assisted by Professor Edgeworth David of the University of Sydney, on 19 November 1911 the party set sail for their second attempt in the wake of the great Antarctic explorers Scott and Amundsen. Shirase's "Dash Patrol" with five men and 28 dogs reached 80.05 South on 28 January 1912. To commemorate the 90th anniversary of the Southernmost year and the early friendly contact between Australia and Japan, this memorial plaque is a symbol of everlasting friendship between both countries. © 2005-18 Australia For Visitors. All Rights Reserved.